Pharma prim 100 mg is a mild steroid, an anabolic with minimal androgenic effect, the active ingredient is Methenolone Enanthate. The effects on the athlete Pharma prim 100 can be compared with Oxandrolone or Boldenone, all Buy Pharmaprim 100 description, side effects, correct use, course, price, reviews, these 3 drugs are practically harmless to the body, quite expensive and significant weight gains from them wait of course not have to. 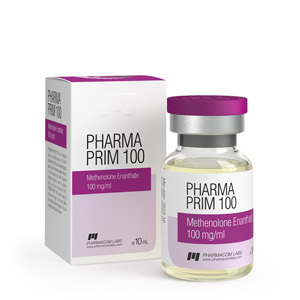 Pharma prim 100 is a derivative of dihydrotestosterone, since the active substance Methenolone is mixed in the air of Enanthate, the duration of action of Pharma prim 100 for an athlete is about 2 weeks. Comparing Pharma prim 100 with other drugs, we can conclude that Pharma prim 100 is most similar to Boldenone, and not to Deco and Masteron. Deca is a more powerful drug than Pharma prim 100, and Masteron is more androgenic than Pharma prim 100 and therefore has a different effect on the athlete. Accepting Pharma prim 100, the athlete gradually gains high quality muscle mass, which is maintained after the cancellation of Pharmaprim 100 mg. The athlete gains muscle mass of high quality, of course, if he eats well and will be visible if the athlete was not a fat before use. You should be aware that if you have 30% fat, then 3-4 kg gained. muscle mass you still will not see behind a layer of fat. Copyright (C) 2018 strongman.biz All Rights Reserved.